Bits and pieces from my son’s and his friends’ conversations that my ‘mom antenna’ had picked up. Perplexed? Here is the translation. I wind ==> I winned==> I won! Whatdra? Thissa? ==> What? This? And yes, it takes a bit of training to get used to this. But once you get the grip of it, you’re golden! 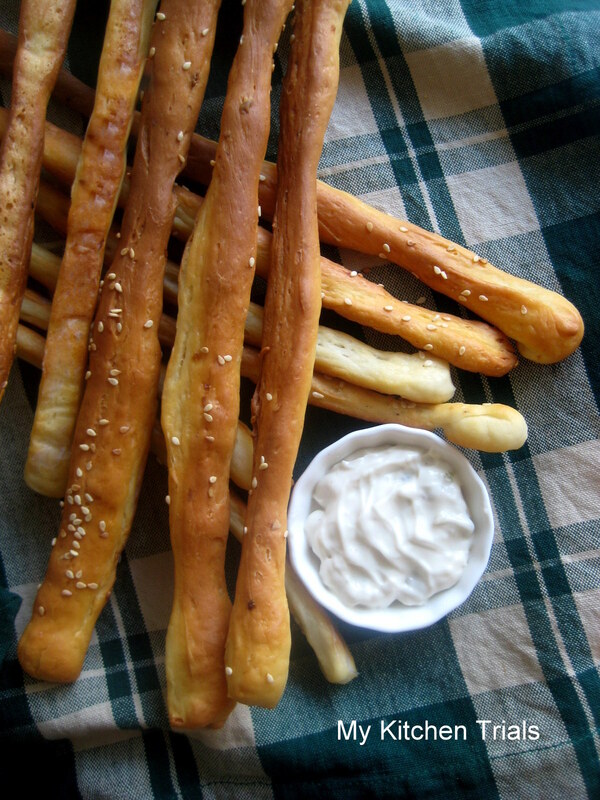 Just like making these bread sticks. Once you get the hang of it, you’re golden. This is my entry for Day 1 of Blogging Marathon 26. The theme is ‘One ingredient – 3 recipes’. I chose maida – all-purpose flour, for this. 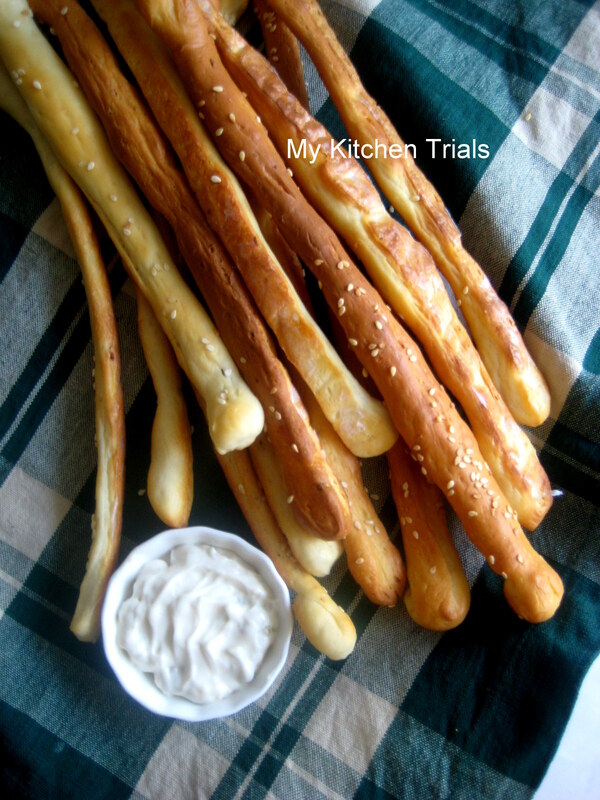 Starting off with fingerfood with maida – bread sticks. Check out the Blogging Marathon page for all entries from fellow participants. You can check this video on youtube for clear instructions on how to shape these. Mix warm milk and the dry yeast. Add sugar, mix and leave aside for 10 minutes to bubble. If the yeast doesn’t foam up, discard it and start again. In a big wide bowl (or food processor), add the flour, salt, crushed garlic(if using), butter and whisk once. Pour in the yeast mix and another 1/2 cup of milk to form a smooth dough. You might have to adjust the milk quantity a bit to get a smooth elastic dough. Knead in a floured surface till you get a smooth, non sticky elastic dough.Shape into a slightly square-ish ball. Set aside in an oiled bowl for about an hour until doubled. Preheat the oven to 200C. Line a butter paper in a baking tray. Once the dough is doubled, cut a strip of dough long the shorter side of the dough. Stretch the strip with your hands, I stretched them to the baking tray’s length. Leave a little space between two sticks while lining in the tray. Once the tray is full, brush the sticks with milk or water and sprinkle the sesame or poppy seeds on top. Bake for 15-20 minutes, keeping an eye on them. Take out of the oven, brush with melted butter and leave aside for 10 minutes. Give it to your kid and make him happy! Interesting conversion and love this perfectly bake cuties..
LOL, you got me rolling with that conversation, as that’s just what my boys do, when they think I am not listening!..really takes practise right..:)..I heart that thissa? ?..Gosh do they have a sidelined language or something…all kids talk like this!..and with those sticks you got me hooked as well..they have come out so well Rajani..looking fwd to what else you are going to make! Laughing here, even sometimes i dont understand my kids conversation,they speak too short sometime i used to blink,dont speak about the sms.Prefect looking grissini, love love with a bowl of soup and cream cheese. Your kids conversation makes me laugh, as you said if we understand its golden. Does this will be crispy or soft like bread. What a yummy looking breadstick and how adorable is the conversation! Love your pictures :) I am already tempted to have some with a bowl of warm soup. the conversation was super!! I must say these bread sticks are addictive!! hahaha loved to read the kiddo conversation. And yeah I am sure we grow antennas once we become mom’s. Phew… The bread sticks look delectable. Looks so yummy and tempting. Nice capture of the conversation. The bread sticks look so crisp and gorgeous. so perfect with a bowl of soup!!! delicious and yummy!! Those bread sticks look really beautiful with that hue. LOL… kids are sooo cute. Loved reading their conversation. Grissini have come out perfect.. 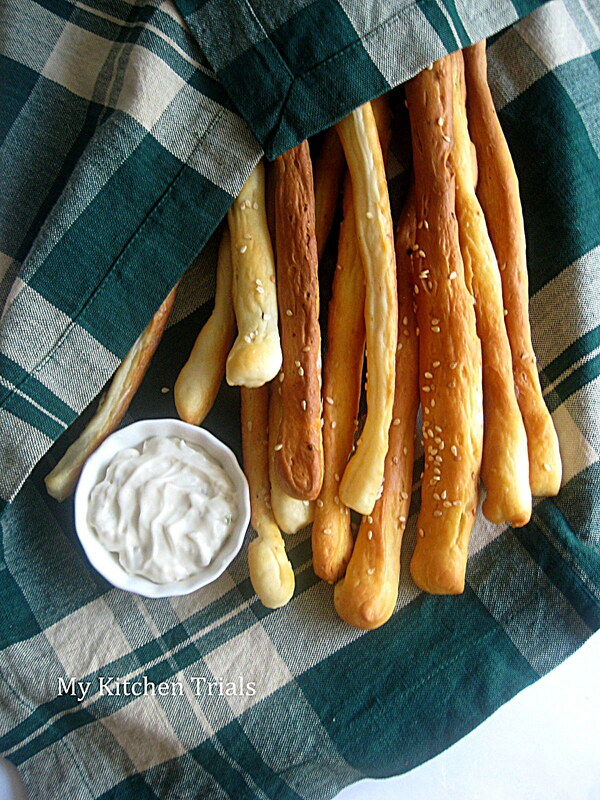 These bread sticks look so yummy & crunchy! I love the perfect golden color on them.